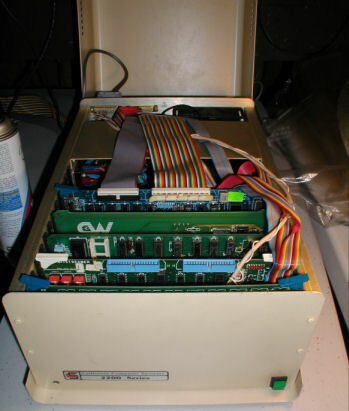 The CCS Series 2200 Mainframe with Jade Controller, 64K RAM, Bitstreamer II, and Morrow drive controller. Power supply OK, s-100 motherboard / backplane voltage OK, Jade Z809 CPU OK, Static RAM OK.
See also pictures of the address select jumpers, i/o jumpers (I/O H = Channel C). I set channel C to 9600 because my terminal is set to 9600b already...and the other two channels have unidentified purpose jumpers, need to look up meaning of jumper connections. PROM VER "DJDMA 2C 81D5"
I have two of these controllers, the pictured here has no modifications. The spare I have has burned out 7805's, and a lot of jumper adjustments. I will use for parts. 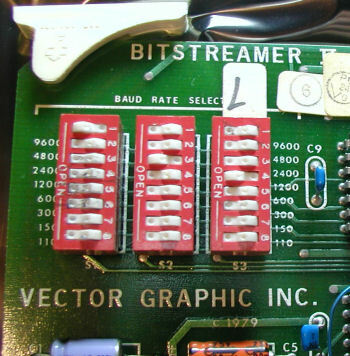 Using Bob Grieb's Z80 ICE v 0.62 I located the bootstrap loader in memory. Here is how I did it. 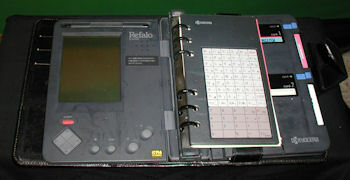 The controller was installed in the known-working California Computer Systems 2200 referenced on this web site. 1. Removed Z80 of the Jade CPU, and in its place inserted the Z80 ICE. Used terminal program to read output to screen. message appears: "stop CPU to use that command"
FF FF FF FF FF FF FF FF FF FF etc. Which I believe that the bootstrap checks an 8 in. drive, then for a 5 1/4"
The bottom line is that even without UART (RS232 terminal interface) I was able to confirm memory, z80 operation, and now the drive controller status.